Surprise them with this elegant collection of premium fare and sweets. It's a gift of classically good taste that delivers cheer and good will! Ghirardelli Chocolate Tablet and Caramel Squares. Chocolate Truffles, Candies and Fresh Nuts. Cinnamon Almonds, Almond Roca and more. Your gift will leave a lasting impression as they continue to enjoy this elegant keepsake leather serving tray with contrasting stitching. 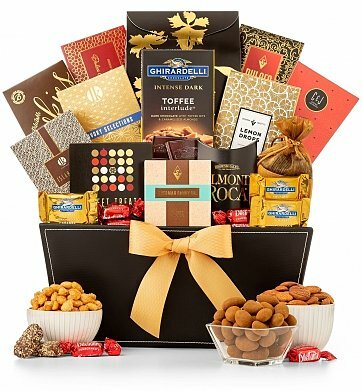 Grand Reception Gourmet Gift Basket is a hand delivered gift. These gifts are delivered by one of our local design centers located throughout the United States and Canada. Same day delivery is available for most gifts when ordered before the cutoff time. The cutoff time for Grand Reception Gourmet Gift Basket is 2 PM in the recipient's time zone. With Ghirardelli Caramel Squares and Dark Chocolate Toffee Tablet. Cinnamon Chocolate Almonds, Pomegranate Truffles and more. Arrives in a tailored black gift basket with an attached card.